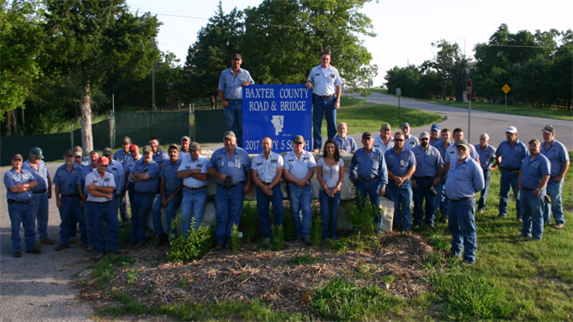 Baxter County Road & Bridge Department was established in 1873. Our mission is maintaining and building county roads and bridges. The first priority is maintaining county roads and bridges with the greatest traffic on a regular basis, while less traveled county roads and bridges being maintained on a less regular basis. Furthermore, we assist the Police, Sheriff's Department and Emergency rescue crews in the evacuations during emergencies. Our team at the Road & Bridge Department takes pride in our efforts to serve the taxpayers of this county. Our office hours are Monday through Thursday 7 a.m. - 5:30 p.m.
We hope that you will find the answers to your questions or concerns. For your convenience, we have provided e-mail addresses, phone numbers and points of contact so that we can be of assistance to you.